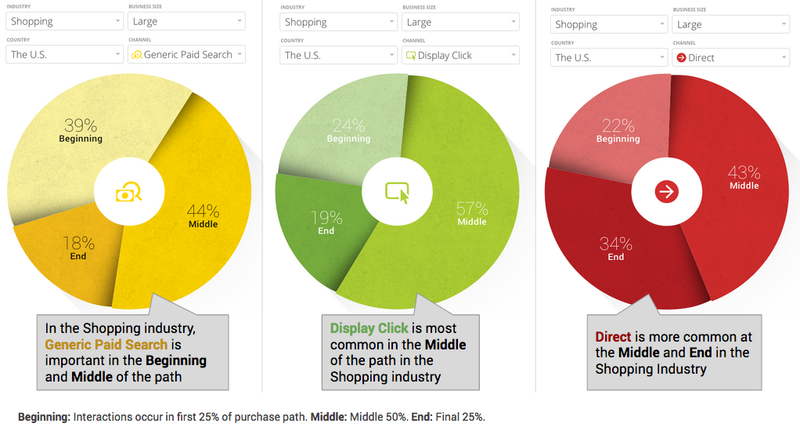 “The Customer Journey to Online Purchase” -- a tool that helped marketers visualize the roles played by marketing channels like paid search, email and display ads in their customers' journeys. The goal was to help marketers learn more about the customer journeys for their industries. If social makes your customers aware, and email makes them convert -- or vice versa -- you can make sure you're in both places with the right kind of message. Today we're happy to introduce a new improved version of the Customer Journey to Online Purchase, with a few key enhancements. We’ve refreshed the data based on millions of consumer interactions, updated the industry classifications, and we’ve split out paid search so you can see the influence of brand and generic search terms on the purchase decision. In each industry you can now see journeys for small, medium and large companies, which can often be quite different. For instance, the above image shows the journey for customers of small businesses in the shopping industry. Note that organic search is very often an "assist" interaction for these customers. Now here's the same journey for large shopping businesses. Note that display clicks and social are strongly assisting interactions -- while display didn’t even appear for the small businesses above. For both small and large businesses, a direct website visit is most likely to be the last interaction. Across industries, the differences from small to large businesses illustrate how different marketing strategies and customer profiles may lead to different buying behavior. And there's more! Now you can drill down into each marketing channel for a closer look at the role it plays based on its position in the purchase path. Channels that occur more frequently in the beginning of the path are more likely to help generate awareness for your product, while the end of the path is closer to the customer’s purchase decision. In these charts, for example, we see the different roles that different channels play in the Shopping industry. One interesting insight is that all channels -- even those traditionally thought of as “upper funnel” or “lower funnel” -- occur throughout the purchase path, but a given channel may be more common at particular stages depending on its role (and depending on the industry). Each marketing campaign and channel may have a different impact on customers depending on when they interact with it. Using what you learn from this tool, you can help adapt your marketing messaging to be more relevant and useful for your customers. Try the Customer Journey to Online Purchase today. And for more helpful marketing insights, check out Measure What Matters Most: our new guide chock-full of suggestions on how to measure the impact of your marketing -- across channels -- to complement what you learn from the Customer Journey tool and take action to improve your marketing. Last year we introduced “The Customer Journey to Online Purchase” -- a tool that helped marketers visualize the roles played by marketing channels like paid search, email and display ads in their customers' journeys.